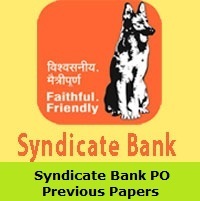 Syndicate Bank PO Previous Papers are available on this page. Candidates who are searching for Syndicate Bank PO Question Papers at various websites, they can stop your search and check this article once. Here we had provided the last 5 years Syndicate Bank Probationary Officer Model Papers in PDF format. Candidates who are willing to participate in the Syndicate Bank PO Examination, they should download the Syndicate Bank PO Previous Papers from this page by hitting on the below given link. Through this article, we had provided Syndicate Bank PO Sample Papers with Selection Process and Exam Pattern. So all the applicants can go through this entire article and capture all useful stuff. At the below of this page, we had attached subjects wise Syndicate Bank PO Previous Year Question Papers. Aspirants should download the Solved Papers immediately and start your preparation now onwards. At the time of preparation, the Syndicate Bank PO Question Papers are very helpful for all the applicants. By practicing more Syndicate Bank Probationary Officer Model Papers, candidates can easily answer each and every question in the examination. Most of the candidates are already started their preparation for the Syndicate Bank PO Examination. So all the competitors without wasting the valuable time must focus on your preparation with the help of Syndicate Bank PO Previous Papers. In the below section we had provided Exam Pattern in a detailed manner. So all the applicants must check those details and work hard to get good marks in the test. The Test is of Objective type i.e., it consists of Multiple Choice Questions. Subject Names – Reasoning, Quantitative Aptitude, English Language, General Awareness. The Exam consists of 202 questions asked from various subjects. The Test is conducted for a total of 250 Marks. Duration of the Test is 2 Hours 30 Minutes. There will be sectional cut off along with overall cut off. And also There will be a negative marking of 0.25 % for every wrong answer. The Syndicate Bank officials will conduct the following selection rounds to hire the candidates for Probationary Officers (PO) Posts. Syndicate Bank Probationary Officer Model Papers are provided on this page for free of cost. The Syndicate Bank officials had released a recruitment notification for 500 Probationary Officers (PO) Posts. For this recruitment, a massive number of candidates applied. In order to select the suitable candidates, the higher officials decided to conduct the Syndicate Bank PO Examination. Candidates who will give the best performance in the entire recruitment process, they will get a job for the Probationary Officers (PO) Post in the Syndicate Bank. For more similar updates keep following Sarkari Recruitment on a daily basis. People should refer to Syndicate Bank Probationary Officer Model Papers along with Answers before starting the preparation. Check the Syndicate Bank Probationary Officer Model Papers Exam Pattern. Know what to study and what are the subjects included in the syllabus. Also, see the marking scheme for each topic and prepare the best preparation schedule. Follow prepared exam timetable daily for effective results and give more time for high weightage subjects. Revise the topics of Syndicate Bank PO Syllabus and Practice Syndicate Bank PO Previous Papers as many times as possible. We suggest all the candidates must practice each and every question paper before the exam date, then you can easily crack the examination with good marks. We wish you all the best for examination. Aspirants just hit on the below given link and download Syndicate Bank PO Previous Year Question Papers without any difficulty at free of cost.